Psyche of a Warrior: John Johnston by Jamie Clubb. It is too easy for my generation to be dismissive of traditional martial arts. Most of us began our training when the most popular systems had become commercialized and branded. We witnessed the dawn of the McDojo. The mystique of the 1970s’ Kung Fu Boom and the 1980s’ Ninja-mania was over when we began. The 1990s spawned some huge changes in the martial arts world; a fair amount was instigated by criticism of the old guard. This led the birth of the mainstream “Reality-Based Self Defence” movement and the emergence of “Mixed Martial Arts” as a limited rules combat sport. The McDojos didn’t decrease; in fact, they continued to grow along with the mystical schools. More martial arts were discovered and created. Along the way revisionists took the traditional martial arts back to their functional roots and created another subculture. However, there is still yet another area of training from the pre-cynicism and scepticism of the early ‘90s that is still healthy today and is also being “re-discovered”. These were tough instructors who believed in teaching the hard basics of their art, who were more concerned with developing the original intentions of the “do” way of early 20th century Japan than anything else. They came from an era when karate was still a minority quantity in the west, when the training was tough and when the rank of black belt was rarely seen in the UK. John Johnston comes from that era and today he embodies the strength of his times. “I first started training with John in the early ‘80s, before my door period, way before leaving my real job to train full time; in fact I got my black belt with Enoida sensei in karate under John’s tuition. He had a big class and he had a strong reputation as a former fighter and city doorman, and as a class karateka. His karate was and still is very dynamic, he is a big man and when he moves the whole room crackles. For a big man he is very fast. He was also as a man that spoke his mind and not everyone liked that (I did), so he did not suffer fools. It is what really drew me to him”. Being naturally athletic, John was not your obvious victim of bullying. This only goes to show how bad racial tensions were at the time and how deep the propaganda was in the collective psychology of those growing up during the era of John’s childhood. Born in 1951, he would have experienced the nationalist racism of the ‘50s, ‘60s and ‘70s that was inspired over fears regarding mass-immigration. John did not seek martial arts to solve his bullying problem – he would be 20 years old before he took up karate. He learnt how to fight well through hard experience and understanding how to utilize his natural attributes. He was an able rugby player at school, becoming a member of the Warwickshire Colts and then later the Coventry Welsh. He boxed for a little while and dabbled a bit in judo, but it was karate that eventually captured his heart. Rick Jackson had recently been training in Japan. A much revered instructor, Rick taught John for two years. John’s dedication to the art was evident and it wasn’t long before he was entrusted with his own class to teach at Henley College. The scarcity of British born karate black belts in the early ‘70s was probably comparable to the number of British Brazilian jiu jitsu black belts in the 2000s. John was just a green belt when he first taught. Always the avid sportsman he took to karate kumite with predictable enthusiasm and vigour. In fact, it would seem he was a little too enthusiastic in his first competition when, as a purple belt, he was disqualified for excessive contact at the Larcano Ballroom in 1973. However, he would soon become a regular on the competition circuit, fighting successfully at regional and national level competitions. This helped prove himself to the higher echelons of the British karate scene. He and his fellow club members began training with the British squad at the notorious Longford Dojo. Here he would trade blows with some of the best in the sport, and as time went on he became far more than a plucky sparring partner. 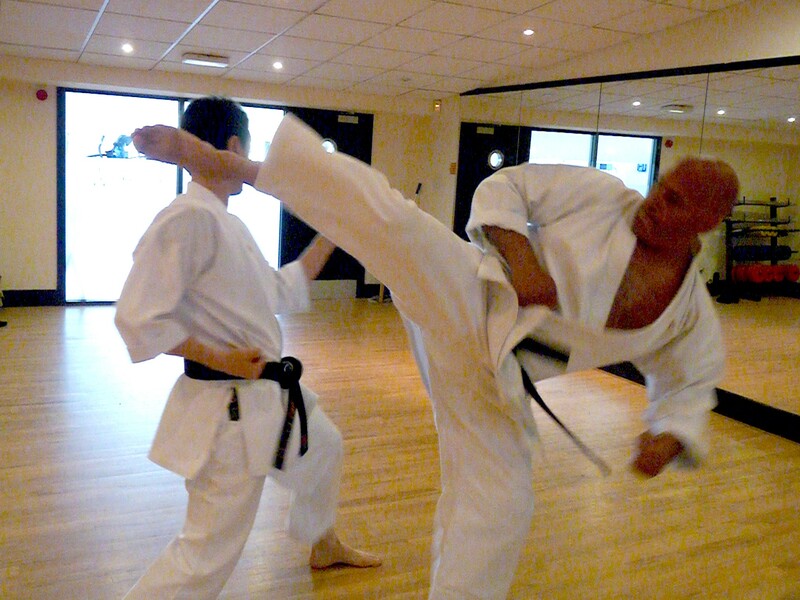 John rose through the Shotokan ranks, taking instruction from some of the luminaries of his day such as Enoeda Sensei, Kawazoe Sensei and Andy Sherry. Despite learning some control from his early days on the tournament circuit, John was still feared for his devastating sweeps. By the time he was running his own clubs as a professional instructor he had caught the attention of the best in the sport and was selected for the Central Region Squad coached the British and European Champion, Frank Brennan. “He was a senior with the KUGB (Karate Union of Great Britain) and everyone knew at the time that they were the elite, it was an amazing association manned by some very serious players, Terry O’Neil, Frank Brennan, Andy Sherry, Bob Poynton, Ronnie Christopher to mention just a few. Just getting a brown belt with these folk was seen as top end, so getting my black belt with them was a life time ambition”. “I even worked for him for a time, again there was always the sense with John that even if he didn’t have any work for me, he’d find work for me, he was that kind of person”. “Initially the majority [of doormen] were boxers and a couple were rugby players. A lot of the guys that I worked with had criminal records for violence and it was after a particularly bad incident at a club that the police made it a condition that no one with a criminal record could work on the doors. It was at this point that I was promoted to head doorman and had to find replacement staff which I recruited from the karate club I was training at and a kung fu club”. “I stayed with Karate because its philosophy and its rigorous training methods have helped me to shape my life and has steered me in a direction which has been good for my wellbeing. “I still teach and train in traditional Shotokan karate but I believe that to make it viable, the mind set in conjunction with the techniques require adaptation to be able to apply them in a way which would be effective. You can take competition techniques, Kata sequences and adapt them for street level protection. It’s not only the physical delivery of techniques that require adaptation but also you have to adapt your psyche”. “I would say that attitude is not only a key part for the foundation of martial arts and self defence training, but is paramount and fundamental to a successful outcome, more so than the physical. If you train for competition you are preparing to attempt to win competition, however, if you prepare for war, you are attempting to avoid war. The attitude and mindset for these two concepts, albeit related are completely different”. “It is hard to find other good teachers after working for so long with John because he was so charismatic; many of the people I went to afterwards, in my search for more martial arts information, were diluted by comparison. But he did also encourage me to explore, he was not one of these ‘jealous husband’ teachers that were afraid of you training with anyone else. Through John’s inspiration I later took my skills to the nightclubs and pubs of the Coventry to further forge and develop myself, and later when I wrote my first book, ‘Watch my Back’, he was very encouraging”. Geoff Thompson often talks about stepping outside of comfort zones. Indeed, much of his philosophy is steep in metaphors about putting yourself into the forge as often as possible and moving toward discomfort in order to achieve the targets you desire. I can’t help but wonder whether John Johnston’s hard earned lessons didn’t have some degree of influence over him. John stepped from an outside world that had shown him cruel violent and irrational persecution and into another focused and disciplined type of discomfort. I asked John what the karate was like when he began and the changes he has seen during his lifetime. “The Karate that was being taught at that time was very basic and very strong physically and mentally and often brutal, with a lot of misguided honesty to it”. “Misguided honesty or naivety: Various training methods which our instructors honestly thought were good for us. Sports science has recently shown us that many of these concepts were not only bad for us but also dangerous. I would say, however, that that kind of regime built a strong mental attitude. Unfortunately it also wheedled out the weaker students very quickly. They wouldn’t come back, which made it elitist. The students that really needed it should have been coaxed and encouraged instead of being put off. Here are a few examples. “We used to block against an unpadded length of 3 by 2 hardwood that was being rammed at our abdomens with considerable force. This was supposed to toughen our arms up, which it did. However, if you didn’t block it you would have a rib taken out. On one course held just before Christmas, a senior British instructor told us after three hours that he was now about to give us our Christmas present. We were told to kneel down, arranging ourselves round the Dojo, which was a converted Ice Skating rink. The last man in line was told to start bunny hopping around the room and over the students that were kneeling down. All the rest of the students followed round in succession. We all did three laps, no body was allowed to give up or be excused before we were allowed to finish. I and my fellow students spent three days virtually unable to walk. Thanks for my Christmas present! “One last but not least of the so called body-conditioning exercises: We were regularly encouraged, advised to go on barefoot runs at least three miles long, around streets and parks. So when I say misguided honesty, I refer to instructors that genuinely thought that this type of body conditioning would have immediate and long term positive effects”. self defence was only really a by-product of karate, and that good karate was about self development, about development of the virtues, ultimately it was about taking your skills to the level where you become of service to your community, to the world at large. I had no idea what he was talking about, and yet, here I am nearly 40 years on teaching just that. “He was always like that though, John, so far ahead of the curve. He once told me that when you were good at your art, even painting a fence became an extension of your karate. Painting a fence, who ever heard of such a thing? The man was clearly mad (I thought). And yet…and yet here I am (again) painting fences and writing books/plays/film/articles all as an extension of my karate. As you can see I owe him a lot. “I also remember a time when he gave me a real bollocking. We had a couple of black belts in the class that I didn’t think represented Shotokan, certainly not Shotokan as I saw it. They were haughty and arrogant. Good technicians I thought but not good men. I told John this; I said, accusingly, that he had let them slip through the net. He told me (with raised voice) that his job was not just to teach the people that were palatable, but also to teach those that had lost their way, teaching pleasant people he said was easy, any instructor could do it, but his job as he saw it was to help everyone, especially those that had drifted from the path. That has always stuck with me. It was a very profound thing to say, and I have quoted it many times since. In the Toa it says that a good man is a bad man’s teacher, a bad man is a good man’s job. He knew that all those years ago when I was still arrogant enough to think I had any idea what I was doing. “John’s emphasis in training was always on good basics. He drilled them again and again. Obsessive basics made me so strong that it literally saved my life. One time in a club in Coventry I was attacked by a gang en masse. They were literally trying to kill me, but my basics were so strong that they could not keep me down, and everyone I hit fell over. Afterwards I said to a friend proudly (I was battered and bruised, but still standing), ‘that was Shotokan!’ I knew why the basics were so important. John taught me that”.